Octavian was the son of Julius Caesar’s niece. The first eighteen years of Octavian’s life were unremarkable, but a surprise in Julius Caesar’s will eventually resulted in him becoming Caesar Augutus, the ruler who transformed Rome into the greatest empire of the ancient world. Julius Caesar was so popular with the Roman people that the Senate named him dictator for life. For five hundred years, the Roman government relied on two consuls serving one-year terms and taking advice from the Senate. Julius Caesar ruled without considering Roman tradition or consulting with the Senate. In 44BCE, a group of enraged senators stabbed the dictator to death. Caesar’s will decreed that Octavian would be his heir and must be treated as his son. Caesar’s decision made Octavian one of the richest men in Rome. It also provided Octavian with something even more valuable: the right to call himself Caesar. Two months after Julius Caesar’s murder, Octavian came to Rome to claim his inheritance, but Marc Antony dismissed the young man. Octavian spent the next several months gaining support with the Roman people. He also raised an army. Soldiers throughout the empire were loyal—not to Rome—but to Caesar. By the end of 44BCE, both Marc Antony and Octavian commanded armies, but the two men avoided civil war by making a deal. In 43BCE, Octavian joined Antony and another general named Lepidus in a partnership historians call the Second Triumvirate. The triumvirate raised money by branding more than 300 wealthy Romans as enemies. They seized the property of the newly designated outlaws and offered rewards to anyone who would kill them. The enemies of Octavian and Marc Antony who could not escape from Rome were killed. 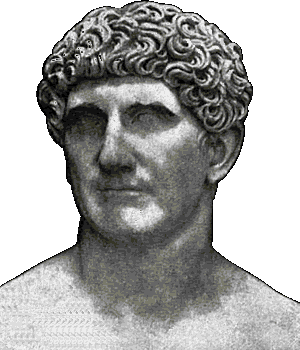 Octavian and Antony forced Lepidus into retirement in 36BCE. Five years later, Octavian became the sole ruler of Rome upon the death of Marc Antony. Octavian earned the loyalty of the Roman soldiers by providing the men with land. The soldiers retired, but because Octavian was Caesar, he knew he could count on their support if the Senate challenged his authority. Octavian lived a modest life because he wanted to avoid the fate of Julius Caesar. He lived in a small house and traveled without bodyguards. Unlike Julius Caesar, Octavian was respectful to the senators. Later in his career, Octavian allowed other men to serve as consuls, but the Senate knew that Octavian controlled the military, so he was the actual ruler of the Roman Empire. In 27BCE, Octavian arranged for the Senate to grant him the honorific title, Augustus. Augustus means “the respected one." During his rule, the Roman people knew Octavian only as Caesar, but to avoid confusion with his famous granduncle, historians generally refer him as Octavian before 27BCE and Caesar Augustus after that. Caesar Augustus ruled for 41 years, a period when Rome developed into a military empire, so historians consider him to be the first Roman Emperor. Caesar Augustus restored peace and order to Rome after years of civil war. He made sure the lands throughout the empire were well run, and taxes were fair. He built roads and bridges, government buildings, and massive public baths. He said, “I left Rome a city of marble, though I found it a city of bricks." 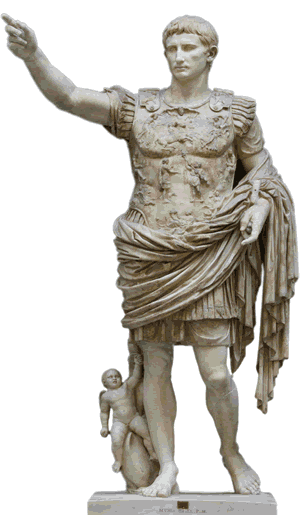 The armies of Caesar Augustus conquered most of Western Europe, North Africa and the Middle East. The Romans claimed all of the land surrounding the enormous Mediterranean Sea, which they nicknamed “a Roman lake." Rome developed into a great empire its army was so powerful that it protected citizens from attack from the tribes who lived beyond the empire. Historian Edward Gibbon later described the two hundred years of peace that began with the rule of Caesar Augustus as the Pax Romana, or the “Peace of Rome." Augustus of Prima Porta is displayed in the Braccio Nuovo of the Vatican Museum. Marc Antony became the ruler of Rome upon the death of Julius Caesar. 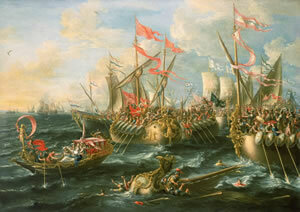 Antony formed the Second Triumvirate with Octavian, but Octavian’s forces defeated A Ntony’s army in the Battle of Actium in 31BCE. 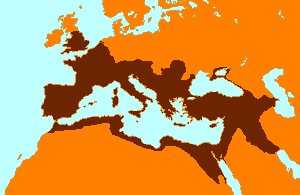 The Roman Empire at its great extent in BCE117, 76 years after Augustus’ death.